I’ve been a bit obsessed with these on Pinterest lately and thought I would try my hand at making one to put on my dresser with all my bits and pieces in (and there are lots of bits and pieces!) 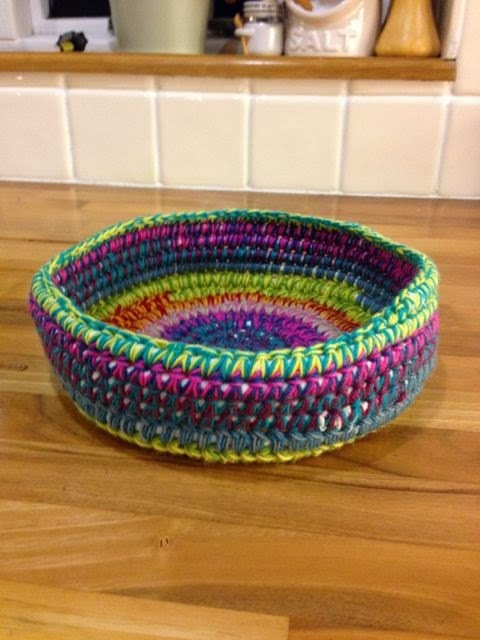 I couldn’t really find a pattern to suit, so I made one up myself using the scraps I had left over from some of my Christmas present projects! The reason I used rope/cord was so that the end result was much more solid and so that it wouldn’t flop about! 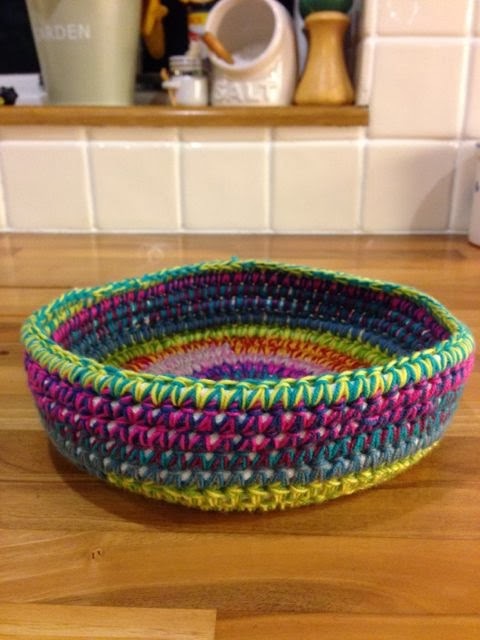 So here is my ta-dah…… A scrappy rope covered basket for bits and bobs! I started with a Magic Ring and then did 8hdc into it. Then I introduced the rope (I used 4mm piping cord) and increased to 16hdc next round (I used a stitch marker as it is more of a spiral than a round) – just wrap the yarn (doubled up here) and make the stitch round the cord. Once you’ve gone round once it is plain sailing as you just keep going. 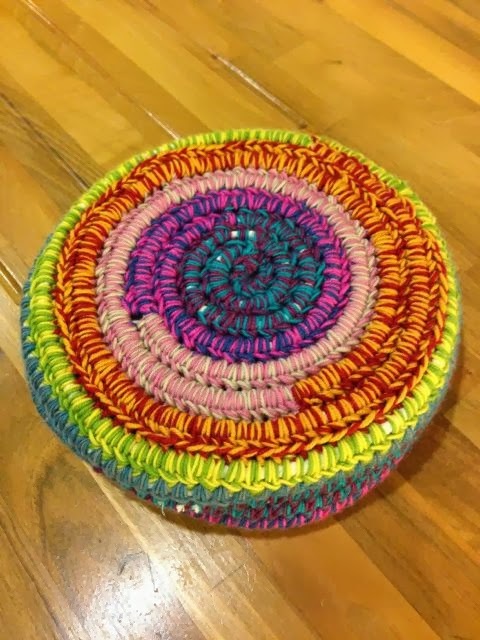 I increased each round of the base, but not by double the amount of stitches each time – generally I was doing 1hdc followed by 2hdc in the next stitch etc, then on the next round 1hdc, 1hdc, 2hdc in the next stitch and so on – it was all a bit trial and error! 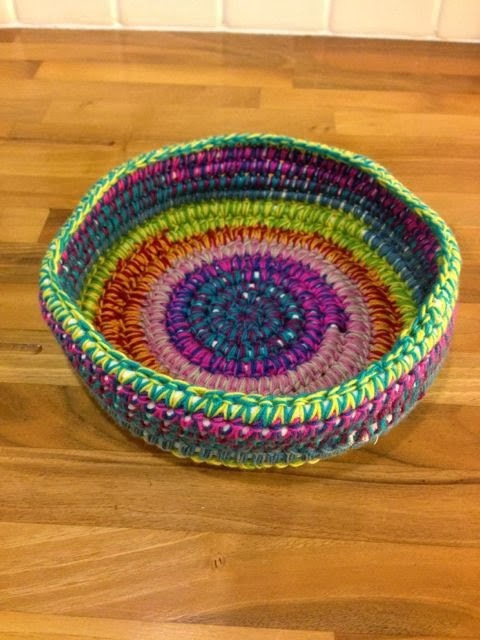 When I started to go up the sides I switched to sc and did the first round just into the front loops of the stitches as this makes a bit of a line between the base and the sides, then I just continued up the sides to the desired height but with no increases at all. This is the underside of the bottom! It will never be totally level as it is a spiral rather than a round – I guess you could do it in rounds but I thought a spiral would be easier. I used a 5.00mm hook and double thickness Sports Weight yarn but you could choose a larger hook and thicker yarn if you wanted. I hope you like it – I’m rather pleased with it! If you decide to make one then have fun! PS: News on the second Moogly Crochet-Along square coming this weekend – for those of you who don’t know what I’m talking about – check here.